At Parc Aventure, children aged 4 to 7 follow courses designed and reserved for them. They are attached to a continuous safety cable; it is impossible for them to become detached. From the age of 8, adventurers are equipped with a so-called “intelligent” self-belay system. The two karabiners are interconnected, and once attached to the cable, can be opened only one at a time. The staff’s role is not only to advise, guide and reassure adventurers, but also to be constantly on alert and available to provide assistance, quickly and effectively, when needed. 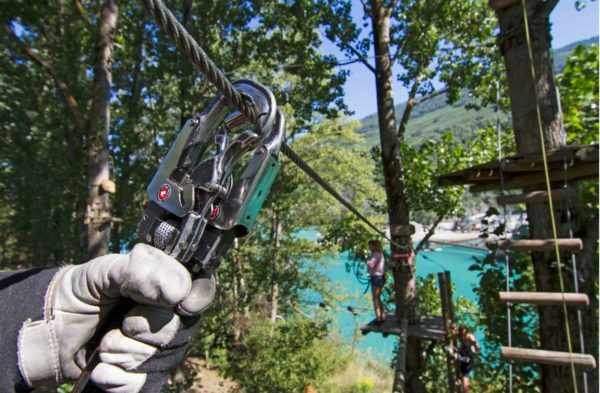 At Parc Aventure, all seasonal members of staff hold a certificate in adventure rope park safety and operation: they are adventure professionals. Parc Aventure conforms to the European standards in force. These set requirements regarding design, construction, control and servicing of the courses as well as operational requirements that guarantee the appropriate level of safety and maintenance. Each day, before the park opens, a routine inspection is carried out on all the courses. The harnesses, lanyards and karabiners are also checked before and after they are made available to customers. Throughout the season, functional inspections in line with the manufacturer’s operating instructions allow the identification of any structural deteriorations. Regular controls are also carried out by an independent inspection body. We take our responsibilities seriously: we attach great value to the environment in which we operate and are committed to preserving it. The construction, operation and maintenance of the parks are based on the greatest respect for the forest, which is protected and continuously monitored. We use non-intrusive attachment techniques, without screws or nails, which protect the supporting trees. Over the years, the courses evolve to adapt to the growth and health of the trees. The network of paths through the park is designed and managed to avoid compression and erosion of the soil through excessive visitor flow. The creation of “green zones” closed to walkers guarantees the natural regeneration of the forest. An annual inspection by an independent arboricultural expert ensures that the trees are in good health. The wood we use for construction is treated with products that are non-polluting and without risk to health (chrome-free). 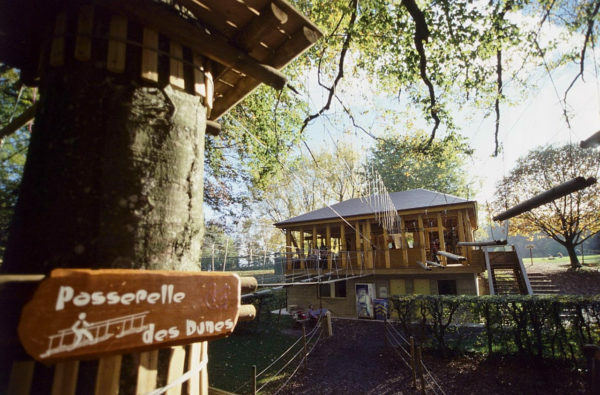 Depuis 2001, Parc Aventure accueille les aventuriers dans ses forêts. Rivalisant d’imagination pour proposer des expériences décoiffantes, nos trois parcs permettent de s’évader, en toute sécurité. A Aigle, Sion et au Signal de Bougy, nous améliorons sans cesse nos installations, pour garantir toujours plus de frissons. Construction d’une nouvelle tour, à Aigle. Refonte de la plate-forme Kidz au Signal de Bougy. 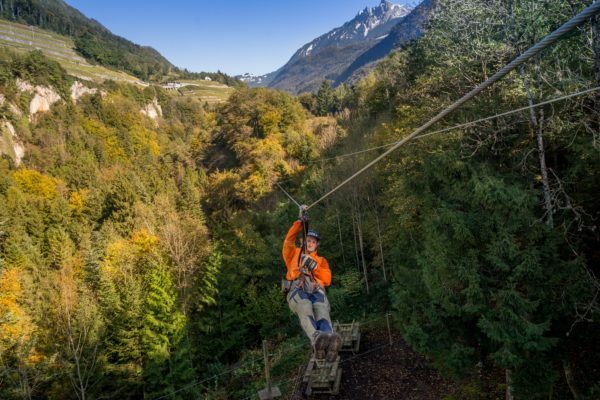 The success of Switzerland’s adventure parks began with an entrepreneur full of ideas and enthusiasm. Thierry Chevalley, head of the Villars Ski School (the first independent ski school), had always been an innovator: his school was the first to offer lessons in snowboarding, for example, and, later on in ski carving technique. 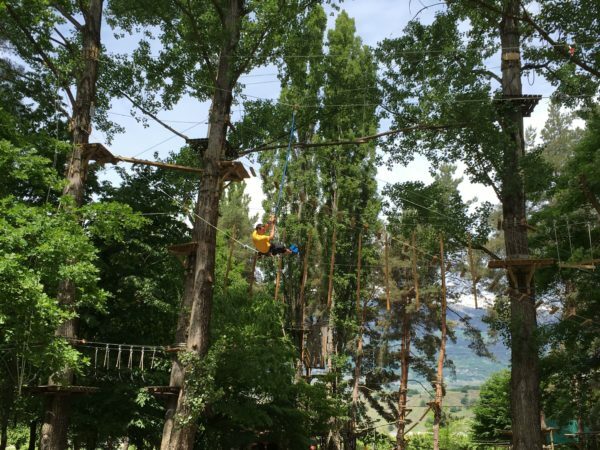 While he was looking for an alternative activity for the summer, he discovered the concept of “accrobranche” in France and decided to import it into Switzerland. 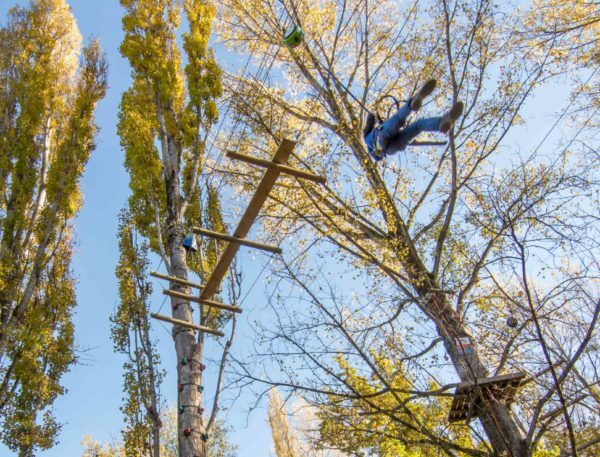 He teamed up with an associate to build his first forest adventure park in Aigle in 2001. Orders soon came in from all over French-speaking Switzerland: Charmey, Signal de Bougy, Sion, Neuchâtel, Payerne… Then from German-speaking Switzerland … Over the course of a decade, the two associates created more than 30 parks. In 2011, the two associates decided to separate the construction and management divisions, while continuing to collaborate closely. Thierry Chevalley took over Parc Aventure and operation of the parks of Aigle, Sion and the Signal de Bougy. He has remained faithful to the pioneer spirit of the early days and inspires his teams with the same ethos. In 2011, he was the first to work with a so-called “intelligent” safety system, which ensures that adventurers are unable to unhook both karabiners at the same time and find themselves unattached to the safety cable 20 metres above the ground. Each year, he offers new attractions to adventurers.